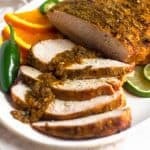 An easy marinated and grilled turkey, this Spicy Grilled Citrus Turkey Breast cooks in 1 hour and is perfect for your small holiday gatherings. 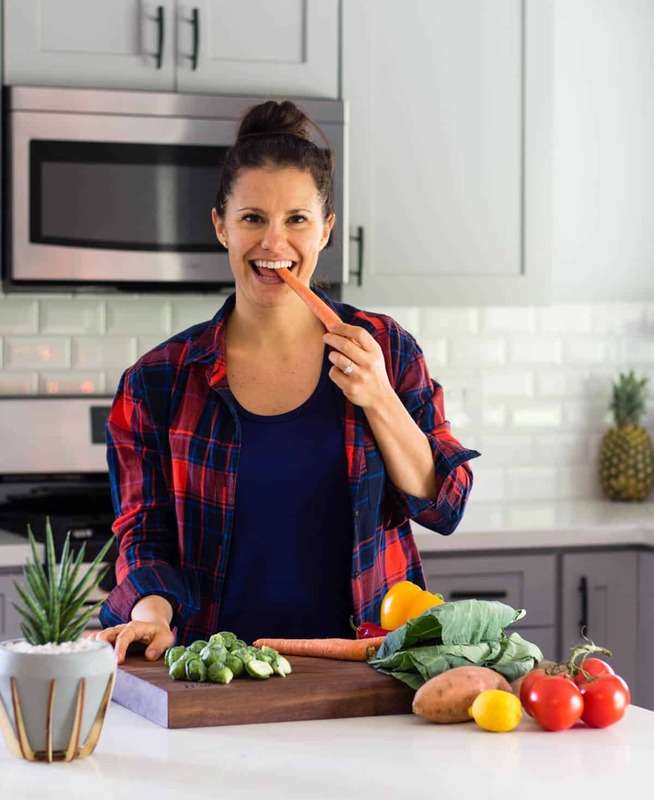 Whole30, paleo, and gluten free! It’s almost that time!! T-minus 2 weeks until Thanksgiving!! What are you planning to make?!? To be honest, we are getting married the week before, having a party at our house the day after our wedding, and then jetting off to Cabo for a few days for a mini-moon. We come back the night before Thanksgiving and I’m not thinking about the menu at all. Luckily my family will still in town and they will have most of that covered. 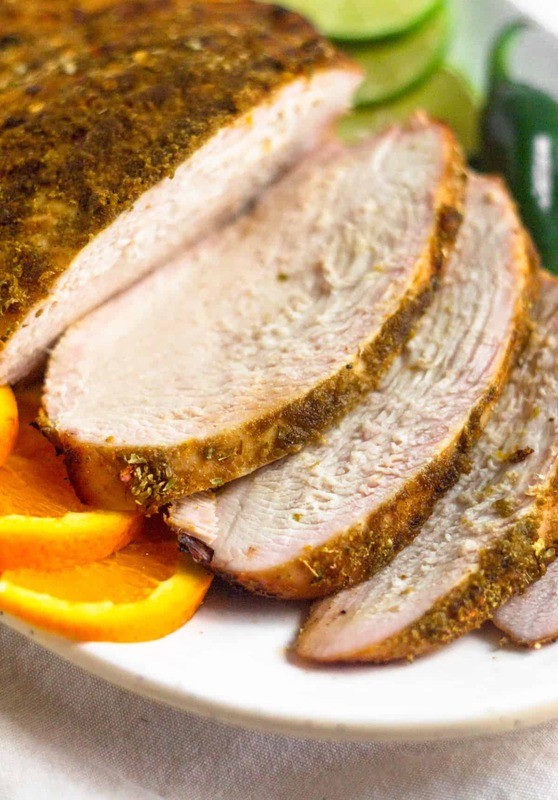 But I know you guys are going to be planning in advance, so I’m sharing this grilled citrus turkey breast with you! While I know a lot of people like whole turkeys, I was never really a fan of dark meat. Give me a few pieces of some juicy turkey breast, some of my mom’s snowy whites (mashed potatoes), homemade cranberry sauce, and some veggies and I’m a happy camper. 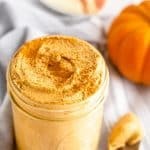 If you are one of those people like me, this recipe is for you! 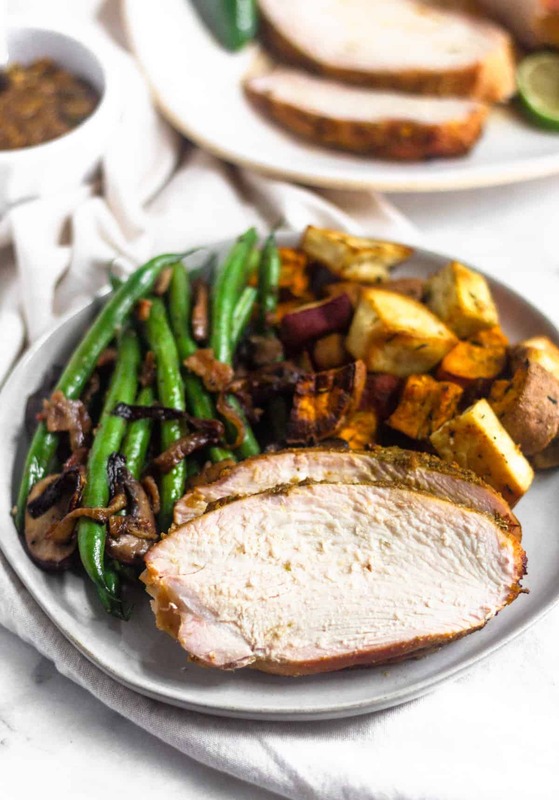 I think it’s a fun spin on your classic roasted turkey breast too if you want to change it up! 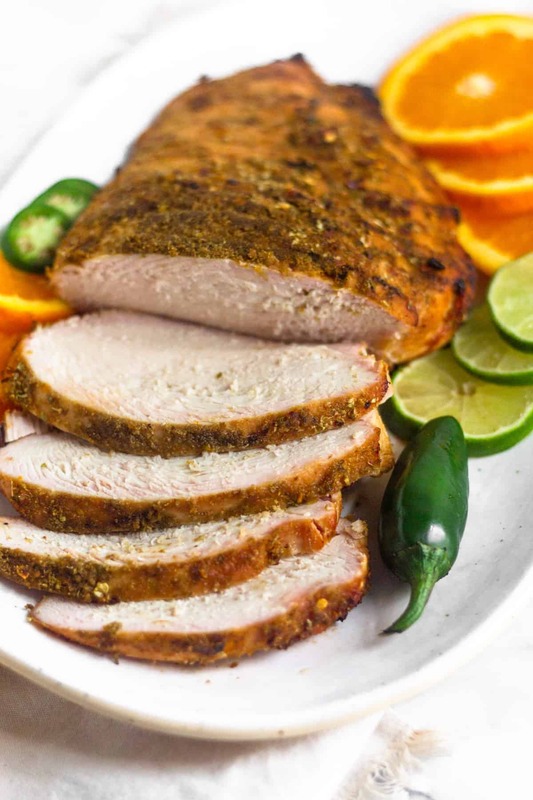 To make this turkey breast, we are starting off with a citrus marinade. 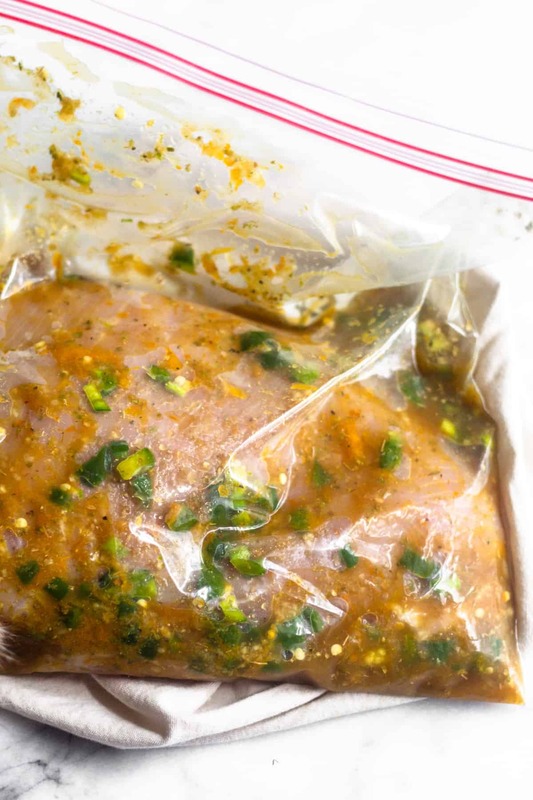 Mix the ingredients for the marinade together and then let it sit in half the marinate for 4-6 hours. 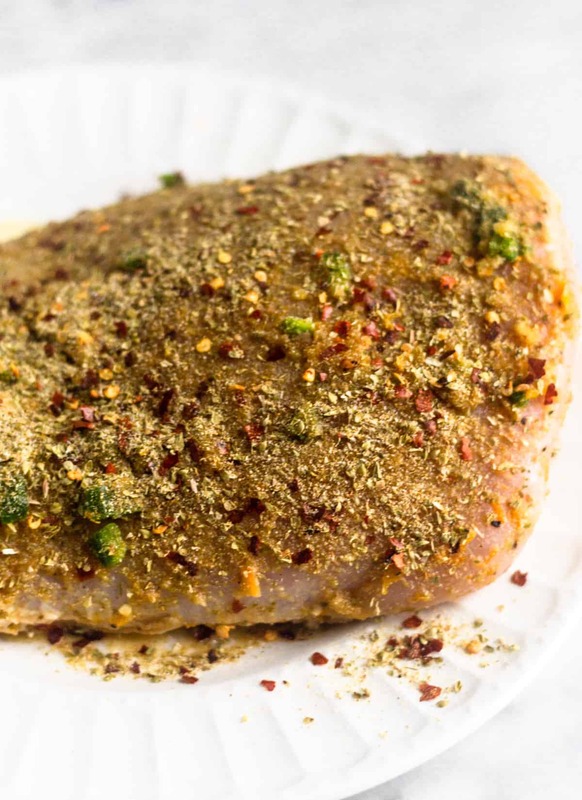 After the turkey breast marinates, you then cover it with a little more seasonings and let it do it’s thing on the grill. I used my Traeger and it came out perfect! 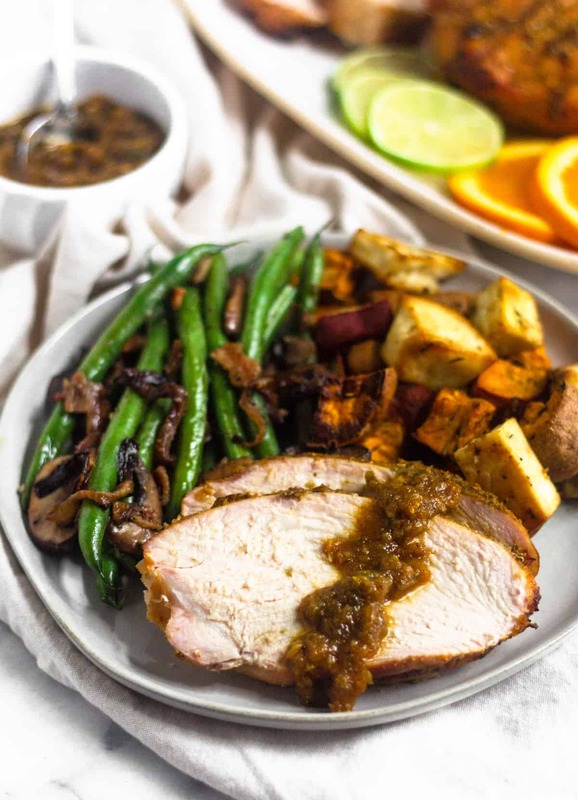 While the turkey is grilling, you make a sauce with the rest of the marinade for topping the turkey. Once the turkey is done, let it rest for about 10 minutes, and then carve it up! 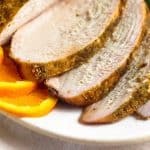 Besides the fact that is turkey breast is super easy, it’s a perfect holiday entree if you aren’t feeding a massive amount of people. I didn’t have a big family growing up and it was usually just us, maybe a couple close friends or a few family members. 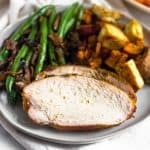 This turkey makes it easy and manageable for a small group. 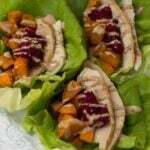 And if you have a super small group, the leftovers make great for turkey sandwiches or soup. 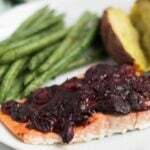 Also, in my opinion, I think the biggest plus of this recipe is you do it on the grill! It frees up that oven space for all the other delicious sides you have going on. 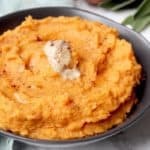 And let’s me honest, Thanksgiving is really about the side dishes! Once turkey is done marinating, removed from bag. 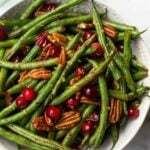 In a small bowl mix together 1/2 tablespoon of cumin, oregano, onion powder, and garlic powder, red pepper flakes, and salt and pepper. Rub all over turkey breast. Preheat grill to 350 degrees. Grill turkey for 45 minutes to 1 hour, depending on thickness, until cooked through and reaches 165 degrees Fahreheit. 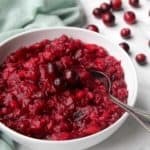 Remove and let rest for 10 minutes before cutting and serving. While the turkey cooks, add remaining marinade to a small sauce pan. Cook over medium heat until it reaches a simmer. Simmer for 5-10 minutes until reaches your desired consistency. Serve overtop turkey if desired. 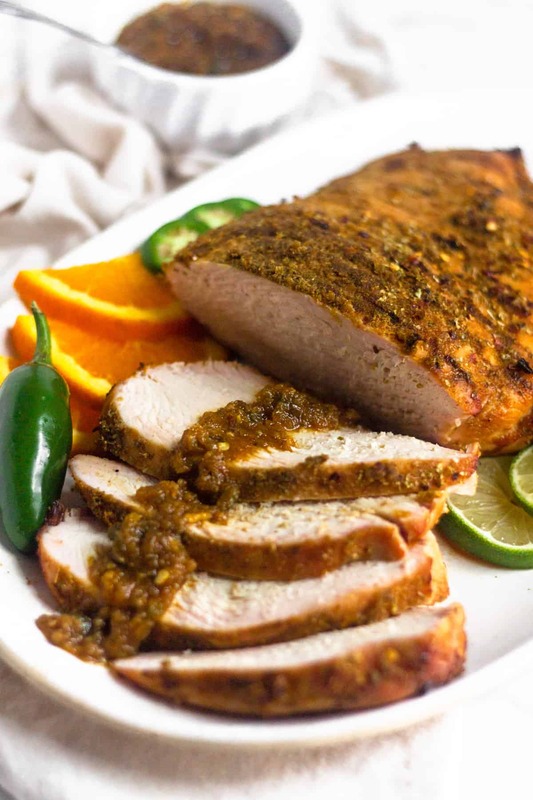 Tried the spicy grilled citrus turkey breast today and my daughter and I loved this recipe but I used the oven instead of the grill, and we both agreed that we will be make it on a charcoal grill next time (well hubby will be making it) as I think it would enhance the flavors! 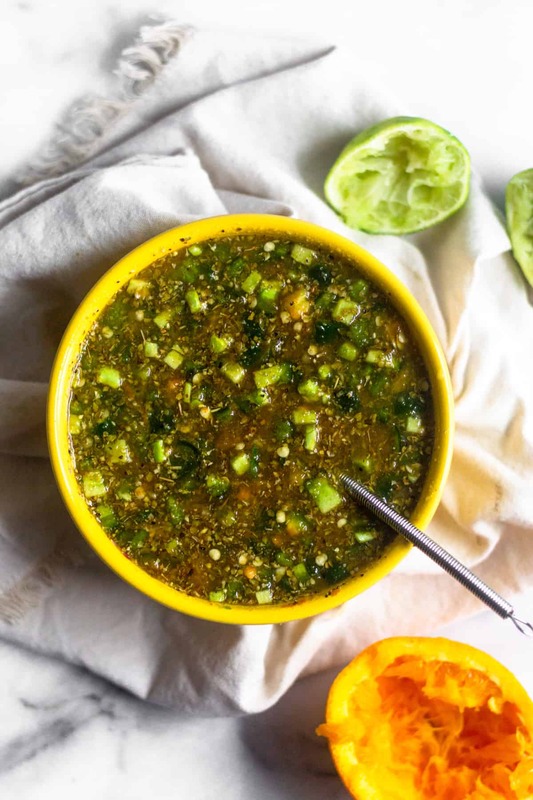 It’s sweet, spicy, as savory and would go great with any side. Also it’s super easy to make! So happy it worked in the oven! I will make a note of that in the recipe so people know! Thanks for trying it Elizabeth!